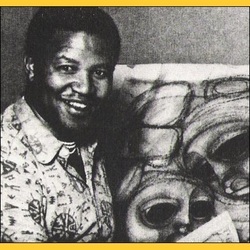 Ben Macala was born in Bloemfontein, South Africa on 21 April 1938. He spent his early years tending cattle on a farm, and did his first drawings on rock formations using stones. Later his family moved to Gauteng. Macala's career as an artist began in 1965. Although he was self-taught he had trained under Cecil Skotnes at the Jubilee Art Centre in 1964, and in 1965 worked with, and received guidance from, Ephraim Ngatane. In 1966 he was studying under Bill Ainslie for a short period. Initially Macala worked as a sculptor, but later focused on mixed-media pictorial work. Most of his works are pastel/crayon studies of people with the aim to show the dignity and tranquillity of his subjects and the importance of the animal world. His most seen images are female heads and mother-and-child studies that have a serene Madonna-like element. These later became popularized and stylized and he began presenting these faces in group compositions. His latter works before his death tend to be more refined and also decorative, compared to many of his earlier works.